No Mana tackled the mau5 aesthetic with his first EP last year as a sort of initiation. It’s not as if he didn’t originally have the repeatable heavy bass buzzing and beat knocking over stretches of synth mentality–mau5trap tend to pick artists who sound like their maestro, deadmau5. Game Over was careful about only utilizing that kind of sound by effectuating vocalists during production, rather than as an after thought. And so is Above The Blue, which breaks away further from dense arrangements, not just with vocals but direction and selection of sounds too. “MOOn“‘s pulsing vibrations tickle the ear and synth chimes help escape the density. A random embedding of a monster made completely of garbage swishing mud–at least that’s what it sounds like–perpetuates the space ship; while the rest of production fills the room with dark hypnotic adventure. Its complex layering burns the bridge between No Mana and Joel, who likes things a lot more simple, and sets an impressive distinction that will carry the alchemist through the rest of the 6-track EP. Unlike “Constellation,” which departed dark bass for a lighter piano arrangement to accommodate Winnie Ford‘s innocent vocals, “Clear” puts on a loop of chopping synth and uses guitar to replace the boost of menacing energy that bass usually inflicts. Zashanell, whose vocals were also utilized in Game Over‘s “Over & Over”, provides a haunting sensation that matches the composition’s tangibility incredibly well. 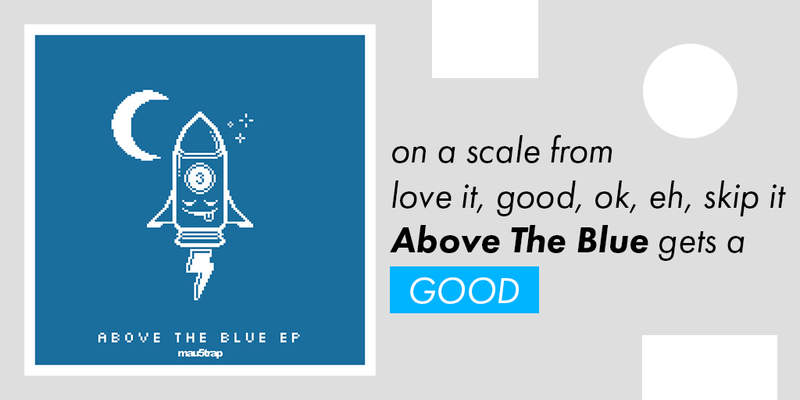 Above The Blue isn’t as grounded as Game Over, which works to its benefit and narrative. It’s a more mature product from No Mana that brings possibilities like instrumentation and quirky lyrics into the mix, fabricating a stronger force against more seasoned players. GOOD.